NEWS ALERT: Our Ash Trees Will Be Under Attack! Got your attention? Good! A serious matter is upon us, and it is much like the issue 84 years ago when our region began losing elm trees to the Dutch elm disease. But, today the threat is to our white, green, black and blue ash trees (Fraxinus spp.) from the Emerald Ash Borer (Agrilus planipennis). This Asian beetle is native to eastern Russia, northern China, Japan, and Korea. It likely traveled to the United States and Canada in ash wood used for stabilizing cargo in ships or for packing consumer products. Although it is believed that Emerald Ash Borer (EAB) arrived in the United States in the 1990’s, it was not detected until 2002 in southeast Michigan and Windsor Ontario. 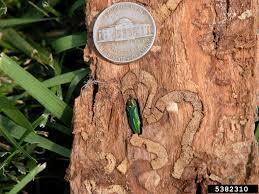 Emerald Ash Borer was first detected in New York State (Randolph) in June of 2009. These beetles can have a one or two year life cycle. Adults begin emerging from trees in mid to late May with peak emergence in late June. Adult beetles leave D-shaped exit holes in the outer bark of the trees trunks and branches. Females usually begin laying eggs on the surface of or just under the bark or in cracks and crevices about 2 weeks after emergence. Eggs hatch in 1-2 weeks, and the tiny larvae bore through the bark and into the cambium of the tree (the area between the bark and wood where high amounts of water and nutrients are transported). 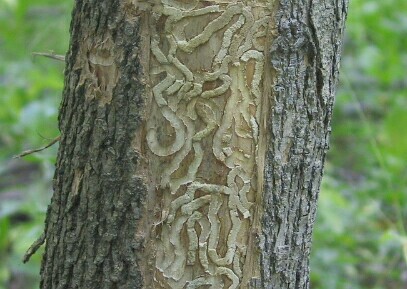 The larvae feed under the bark for several weeks, usually from late July or early August through October. The larvae pass through four stages and eventually reach a size of roughly 1 to 1.25 inches long. Most EAB larvae overwinter in a small chamber in the outer bark or in the outer inch of wood. Pupation occurs in spring and the new generation of adults will emerge in May or early June, to begin the cycle again. Signs of infection included tree canopy dieback, yellowing, and browning leaves. 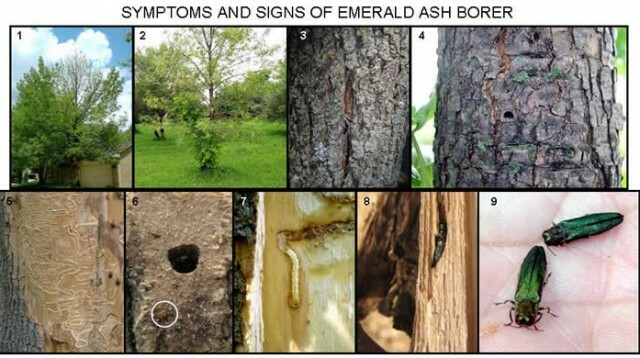 “The biggest concern about EAB is that you will more than likely notice your ash tree dying before you ever see the insect responsible for its decline (Wedge Community Coop Newsletter, Aug-Sept, 2009).” Heavily infested trees exhibit canopy die-back usually starting at the top of the tree. One-third to one-half of the branches may die in the first year. Most of the canopy will be dead within two years of when symptoms are first observed. Some ash trees will also push out sprouts from the trunk after the upper portions of the tree dies. Most trees will be completely killed in 3 to 4 years. In the Detroit, MI area alone, the infestation was so significant that over 70,000 city ash trees have been lost! Research has shown that EAB adults can fly only ½ mile from the tree where they emerge. It appears that many infestations were started when people moved ash nursery stock, logs or firewood. In NYS, the movement of firewood it is believed to be the most common form of transportation for these insects. It is likely that people may move firewood that originated from trees infected or killed by EAB. The people moving firewood are not likely aware that they are moving eggs or larvae of these pests, which may be hidden on or under the bark or buried deep within the logs. Therefore, the best recommendation to stop the spread of EAB is to stop moving firewood! Please purchase firewood locally and close-by (less than 50 miles) your recreational destination. In NYS, only firewood labeled as meeting NY’s heat treatment standards to kill pests (kiln-dried) may be transported into the state and further than 50 miles from the firewood’s source. (Acceptable firewood heat treatment must raise the core temperature of the firewood to 71 degrees C, or 160 degrees F, and hold it there for at least 75 minutes). At the time this article went to print, EAB has been detected in 22 states. New York is one of those states, and 21 counties within NYS have detected EAB. 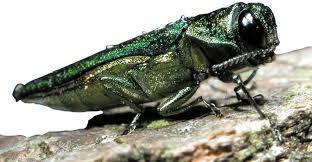 Two Canadian provinces (Ontario and Quebec) close to NYS have also detected EAB.